Wait, am I allowed to use Super Bowl in my blog title? Maybe I should've used "Big Game?" Mr. Goodell, if you're reading, please accept my apologies in advance. 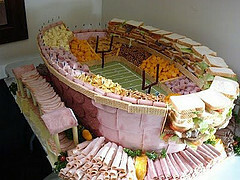 I do hope that the Super Bowl Big Game will truly be super big this year. "We are not using her as a sexual object." My thoughts? Very nice car - I wish they would show more of the car. And is Kate Upton actually washing the car - or are the football players washing it? A winding story line to say the least. Lincoln does a good job of reminding the viewer of a story and a brand that starts with "you." SodaStream International takes a nuanced environmental angle in showing branded soda bottles exploding while touting it's seltzer making machine. In case you're not planning on watching the game, you can see all the ads here. One last thought. If you have $3.8 Million to spend - call us. We can give you 16 years of inbound marketing for that amount. And people won't forget about your ad a few days after the game.